Interest rates have been creeping up since December. Interest rates needed a dramatic event to turn the tide, and we saw that on Monday. With uncertainty regarding the results of the Italian elections, the stock markets tanked and interest rates received a much needed jolt. The Mortgage Backed Security market closed the week (+ 59 bps), pushing rates to their lowest levels in over a month. The sequester came and went on Friday and it appeared the markets were expecting it, with no major movement. The next debate is the debt ceiling, with the Federal government set to run out of money later this month. On Friday of this week, the unemployment report comes out which usually has a pretty large effect on interest rate pricing. Remember that FHA is raising their mortgage insurance premiums and making them last the life of the loan on April 1st. If you pull your FHA case number before that, you can still qualify for the current guidelines. I hope everyone had a great President’s day and hopefully got the day off of work. The MBS market closed down (-48 bps) on the week. Most of the movement was due to a monthly rollover. Even though the MBS market was down, interest rates stayed almost identical to the week before. -The release of the FED minutes from January on Wednesday. This is one of the events last month that led to rates rising. If the FED conversations lead investors to believe that the FED plans to move away from QE or purchasing bonds and mortgage securities – rates will likely rise. -The release of various housing data that should give more indication on the direction of the economy. We have a bullish stock market and rising confidence in the economy – not good signs for interest rates. I still think we are in a market where interest rates are more likely to rise than fall. The one ace in the hole for interest rates is the debt ceiling debate. If the sequester happens and large mandatory spending cuts take place, I think we will see stock markets drop some, and interest rates drop some. However, I think that is unlikely to happen. My recommendation is still to lock on any improvements. If you can refinance and lower your rate with $0 costs – that is never a bad thing. If rates drop again, you can always refinance again as very few loans hold prepayment penalties any longer. On January 1st, Congress finally came to a deal to avoid the “fiscal cliff”. The deal essentially kicks the main issues down the road, but averts the tax increases for the majority of Americans. As expected, the markets responded and the stock market surged and mortgage rates went up. Currently the Mortgage Backed Security market is trading down – 22 bps on the week. Fortunately, because the Feds continue to buy and keep demand in place for mortgage backed securities, rates were not hit that hard. The average 30 year fixed pricing went up .23 pts at any given rate. Shorter term loans and ARM pricing did not go up as much. 3.) Increases taxes on dividend and capital gain income. So one part of the Fiscal Cliff is resolved – the major tax increases that would have affected all Americans. The other issue that was kicked down the road was the debt issue. There is a 2 month period before automatic spending cuts will go into effect for the US treasury. So the debate on the fiscal cliff is really just beginning, with the US deficit still not addressed. Congress will have to come to an agreement on key spending cuts or raise the debt ceiling again. The markets will likely remain volatile until March 1st, as a deal will likely not happen until the last possible moment. Rates are very volatile right now and the benefits in locking a loan outweigh the risk and possible pricing improvement that may accompany floating a rate. Rates are only .125% higher than their all time lows. I am recommending locking at this point. If rates drop .25% during the loan process, a rate can be floated down. Interest rates did not change much over the past week. The mortgage backed security market closed last week trading down (-3 bps). This week the MBS market is trading up (+6 bps). All eyes remain on the fiscal cliff negotiations. We are getting down to the deadline and the sides still appear to be very far apart. Congress will reconvene on Thursday and the President will be back from Hawaii on Thursday. Some insiders still believe a deal will get done, while others are more pessimistic. Some think that going over the cliff will cause serious economic repercussions, some don’t. So you are seeing conflicting points of view on all angles of the fiscal cliff. Going over the fiscal cliff will cause taxes to go up for all Americans, but many believe a tax deal will get done before the new tables are released even if a Fiscal Cliff deal does not get done. The market is most concerned with the tax rates, as more taxes equals less disposable income to spend on goods and services. Unfortunately, it appears likely that the issue of deficit reduction and spending cuts will get kicked down the road. If the Fiscal Cliff or Tax deal get done, rates will go up slightly. If they don’t, rates will go down slightly. If you are planning to start a new FHA loan, or streamline your existing FHA loan – I wouldn’t wait. I hope everyone had a happy and safe Thanksgiving!! Interest rates rose last week with the Mortgage Backed Security market trading down (-53 bps). The stock market has been doing very well recently with optimism that a Fiscal Cliff deal will get done and positive signs from the economy. I think the stock market is probably overbought a little bit, so I expect some rate improvement this week. On Monday morning, the MBS market is trading up (+22 bps), so rates should improve from their close on Friday. I do not expect a huge change in pricing, but I do predict some movement in a positive direction for interest rates. The Holidays are usually a popular time to refinance. You always get a 1 month payment deferral on your mortgage, and you get refund from your old escrow account after closing if you impound your taxes and insurance in your payment. I can still get most loans done today by Christmas. If you are interested in lowering your payment and getting some extra cash in your pocket for the Holidays, please call me today. Interest rates rose slightly last week with the stock market optimistic that a deal will get done to avoid the fiscal cliff. The Mortgage backed security market closed last week down (-28 bps), and is currently trading on Monday down (-11 bps). On Friday, President Obama met with other political leaders to discuss the fiscal cliff. Both sides seem to be softening their stance so the stock market is optimistic that a deal will get done – which is pushing stocks up and mortgage backed securities down. This is a shortened week due to the Thanksgiving Holiday. On Monday, housing data was released that continues to show the housing market improving. On Tuesday, The European Union is meeting with Greece regarding additional funds to avoid the country defaulting on it’s debt. Ben Bernanke is also speaking at the NY Economics Club. The market will be listening for clues on the Fed’s next move. Rates are still trading in narrow ranges with the same rates available with fluctuating costs depending on how the market is moving. 30 Year Fixed rates at 3.25% are still available paying a point. I see interest rates remaining in this range through the end of 2012. Last week was a pretty tough week for interest rates. Mortgage pricing went up Monday through Thursday, but a rally on Friday pulled interest rates back down a bit. The Mortgage Backed Security market closed last week trading (-64 bps). On Monday, the market is currently trading down (– 8 bps). WHERE WILL MORTGAGE RATES GO FROM HERE? Most agree that rates will not rise substantially with the weakening MBS market. Even though rates have trended up for the majority of two weeks, rates are still very low. Mortgage rates will likely stay in the range they are now. I don’t think rates will go lower than the rate pricing we saw a couple of weeks ago, but I also don’t see them going substantially up from where they are now. Confidence in the economy is growing which will typically cause a rise in rates. But the FED introducing QE3 will help them remain low for the rest of 2012. This week starts with the Presidential Debate on Monday. The Treasury will begin a 99 billion note auction on Tuesday. The Federal Open Market Committee is meeting on Tuesday with a press release on Wednesday. September results from new homes sales are released on Wednesday. Barring any unforeseen events – I am hoping that rates will improve a little bit this week, but I don’t see anything too drastic happening one way or the other. My lock recommendation is to lock on any rate improvement this week. The MBS market closed last week trading (+ 12 bps). So far on Monday – the MBS market is trading down (-12 bps). Rates went up for 5 straight days and then we were able to recover with some positive MBS trading days. There shouldn’t be any change in rate pricing from last week, but we saw a pretty good improvement in both rates and pricing this week. Some lenders react differently to the market than others. To start off this week, the market received earning results from retail and auto companies that exceeded forecasts. This has caused the stock market to trade higher and rate pricing to be a bit higher. The big events this week include the Presidential Debate on Tuesday. The market always seems to react to the debates the next day. Also, later in the week the European Union is holding a summit. Although Europe is still nowhere near a resolution to their debt problems, there are positive signs showing that progress is being made. I recommend locking at this point. There will be a lot of uncertainty with the upcoming election. Rates are very close to all time lows. Below are some lock perspectives from different originators for Mortgage News Daily. I agree with Tim Elkins in that if you can refinance with $0 costs and lower your rate – it is worth doing. There are no prepayment penalties, so you can refinance again if they go lower. Loan Originator Perspectives from www.mortgagenewsdaily.com. “To be honest, my personal opinion says rates to go higher. Maybe a “late year” stock market rally as well as election results. Things “need” to look like all is good in the markets. As a result, I think rates go slightly higher. 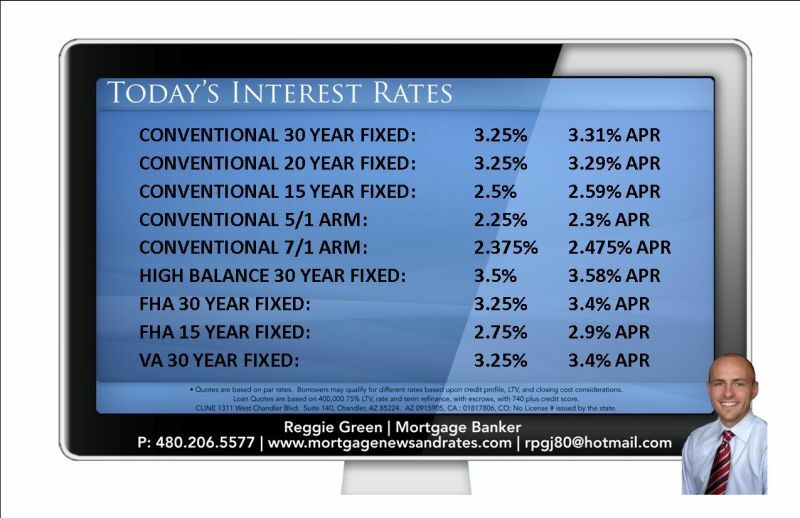 I doubt we see sub 3.25% rates….but you never know! Regardless, rates are incredibly low. Worst case is you do a “no cost loan” now…and rates fall….and you do it again! Good luck….” –Tim Elkins, CEO, Crossline Capital. With the below rates, I have added to the rate breakdown for $0 cost loans. Just to clarify, 0 points does not necessarily mean $0 fees completely. In the rates below, I clarify the rate I can usually get someone with 0 points and $0 costs. This does vary by area depending on title fees and transfer taxes the county may charge. Last week the mortgage backed security market told 2 stories. The MBS market closed (+ 50 bps) from Monday to Tuesday. This continued the trend of rates dropping since the FED announced QE3. But every positive interest rate streak will eventually end and pull back the other way. From Wednesday to Friday, the MBS market closed down (– 84 bps), finishing the week (– 34 bps). The week was capped off with the September unemployment rate dropping from 8.1% to 7.8% with 114,000 new jobs created. There was a lot of controversy regarding the validity of the report – but either way the MBS market had a mini sell off and closed the week down. Mortgage rates are still very low, but a bit higher than their previous lows. The bond market is closed Monday due to Columbus Day. I don’t expect a ton of rate movement next week, but I do think rates may improve a bit, taking back some of the losses of last week. Keep in mind most news websites/channels report when rates drop but not so much when they rise. Rates are always fluctuating until a loan is locked.